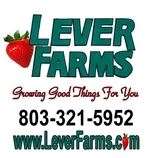 Lever Farms is located in the rich fertile soil of Newberry County. We are a family owned 115 acre working farm-open seasonally for fresh local produce, strawberry picking, fall fun and much more. We are conveniently located off I-26, just a short country drive from Chapin/Irmo/Columbia area. We are a small family farm where we work side by side to grow good things for you. Our farm is worked by our family for your family. The land we farm has been in our family for over 100 years. From our humble beginnings in 2004, when we started vegetable farming, to our first crop of Strawberries in the fall 2006, right through to harvesting our first crop of pumpkins in 2015, we’ve been working hard to grow naturally delicious produce. We have moved to more of a diversified farming operation to include cattle, pork, bees, and agritourism. Lever Farms continue to evolve to meet the needs of our customers while remaining committed to preserving the land and heritage for future generations. We’ve created a family-friendly, welcome atmosphere that gives visitors the opportunity to experience life on the farm. Our goal will always remain the same- to provide safe high-quality produce for our customers. We are thankful every day for our ability to work hard and for the blessings that God has bestowed upon us. All that we have are gifts and blessings from God, because He is the only one who can make us grow. Each year we enjoy spending time with old familiar faces as well as meeting many new ones. We’re glad you stopped by, and hope your visit leaves you wanting to return! To us at Lever Farms, it’s more than just farming-it’s Faith, Family, and Farming. What a difference that makes! Lever Farms family is honored to serve you. Take I-26 (Exit 74). Turn Right onto SC Highway 34 towards Winnsboro. We are located 7.5 miles from I-26 on the left. Take I-26 (Exit 74). Turn Left onto SC Highway 34 towards Winnsboro. We are located 7.5 miles from I-26 on the left.